BIGGER Book Review. 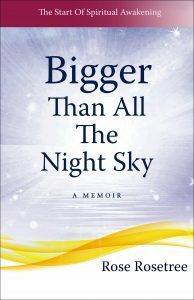 Mari Carlson, an independent book reviewer and blogger, has selected “Bigger than All the Night Sky” for a review. That’s a bigger honor than you might suppose. For instance, do you have any idea how many Americans have indie-published their own books? Hint: Nor just me. Last year the number of self-published books in America passed 1 million. And what happens to the numbers if you include other published books? Here’s the most recent statistic I could easily find: Over three million books were published in the U.S. in 2010 alone. You can see it at Mari Carlson’s website, Mari’s Book Reviews. There you’ll also find more of her stylish, perceptive book reviews. However, I’m also excerpting it below (with Mari’s gracious permission). Be sure to read the final paragraph. My fave, anyway! Worth noting: You can also learn about this spiritually-oriented memoir at this part of my website. As befits a book about spiritual awakening and personal growth, how could I resist giving you’all a bunch of free tastes… right there? Obviously I couldn’t resist. Since I find you Blog-Buddies pretty irresistible! More than a memoir, this healer’s personal history encourages self-inquiry. Rose Rosetree, born Laura Sue Rosenbaum in 1948, grows up in New York to intellectual parents. Shy, studious and curious, she, too, loves learning. The classroom to her is an opening to new worlds. A surgery at age 5 also opens her to a new, beyond time, world she calls “That,” to which she returns throughout her life. At an international high school, she gravitates toward literature and philosophy – and love. In college she discovers Transcendental Meditation (TM), which does more for her academic success than studying, as well as a hip boyfriend. A genuine tale of sixties culture, her story is a chain of experiences linked by a desire to go deeper, know more, and enjoy life. This book follows its own dictum: “Stories that are supposed to ‘explain everything’… don’t” (89). Addressing her audience as Questing Reader, she goes beyond explanatory narrative to human connection. She reaches people through anecdotes that engage physically, socially, and spiritually. Senses, particularly smell, play an active role in the story, recalling the distant past and the fragrance of God. The tone is conversational, full of colloquialisms and asides, like being let in on secrets. Carved into bite-sized chunks of chronological sequences, fantastical happenings, lists of insights, and poems, mostly written about her experiences in TM, the varied prose make it easy to stop and reflect without losing the thread of the story. Intended for adult learners, the book achieves its purpose to entertain and educate. The end is just the beginning: an invitation to read more of the author’s books and to check out the Rosetree Energy Spirituality website about workshops, sessions and trainings. 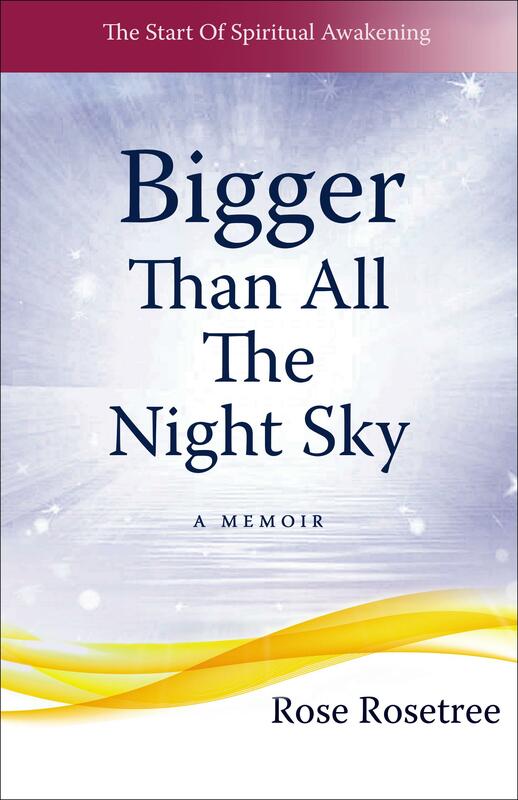 Please let friends know about “Bigger Than All the Night Sky.” Word of mouth is the main way that indies like me can reach new readers. Of course, another possibility is writing your own reviews. For instance, that link in the last paragraph will take you to the memoir’s listing at Amazon.com. Even a short review can make a big difference. Probably the number of reviews at Amazon, plus the number of stars… is the single biggest factor in giving clout to any of my books. Besides thanking Mari Carlson, I want to thank those of you who have gone onto Amazon and reviewed this book, inspiring many — me included. Also, I’m giving a grateful shout-out to Sandra Haering. Culling the best of the best, she meticulously researched over 300 book review sites, sending queries as appropriate. And this review, this one superb review, is the (only) fruit of all that labor. That kind of loyalty, generosity, and brainy persistence? You won’t find it everywhere. But you’ll sure find it in Sandra Haering. BIGGER whole -heartedly deserves every word Mari wrote. I’m so happy for you. Wow! Thank you Sandra! Thank you, Mari! Thank you, Rose! I also know what it’s like to write a book review, and it’s not that easy! This one is great. So beautifully written. She has really understood the book. And thanks to Sandra Haering too. What a great reminder that there really isn’t just luck in life to get what you want. It does take hard work and patience! Wonderful for you Rose and kudos to Sandra. Mari captured the essence of BIGGER so well that it inspires me to read it again. I’m always so happy to witness the curiosity and spark in others, especially from newbies to RES and all that Rose offers. Sandra thank you for all of your hard work! Yay Sandra for your efforts. What a lovely and well written review! Your book deserves every last lovely word.